The scope mounts provided by Arsenal are the products of exceptional research and development. These side-attaching, tension adjustable scope mounts were developed and tested in the toughest conditions to perform without failure. Featuring a one-piece construction and CNC machined from aircraft grade aluminum, each variant offers minimum weight (only 5.76 ounces on the SM-13), maximum strength for increased reliability, and streamlined design keeping the mount unobtrusive during use. Arsenal has also incorporated a relief cut along the rail allowing the use of iron sights even when the scope mount is attached to the rifle. While these mounts were originally intended for use in the military, they are adaptable to other common uses such as hunting, competition shooting, or even a casual day at the range. These scope mounts are ideal for most AK variants. The SM-13 features a long picatinny rail. 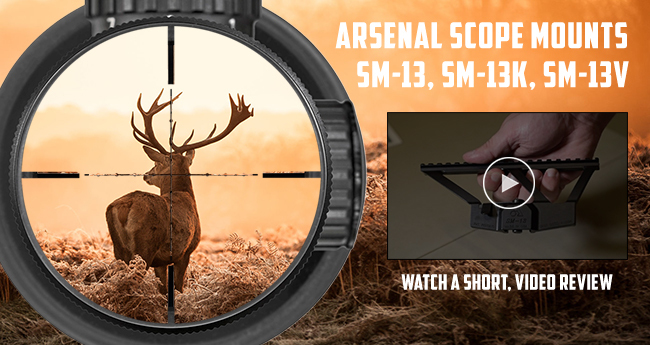 If you are looking to attach a scope on an AKS-74U or Krink model, the SM-13K is the best choice. For customers using VEPR products we offer the SM-13V. This variation of our standard SM-13 features a 7.5 inch picatinny rail and is designed to follow the contour of the VEPR rifle closely for a secure, low profile fit.